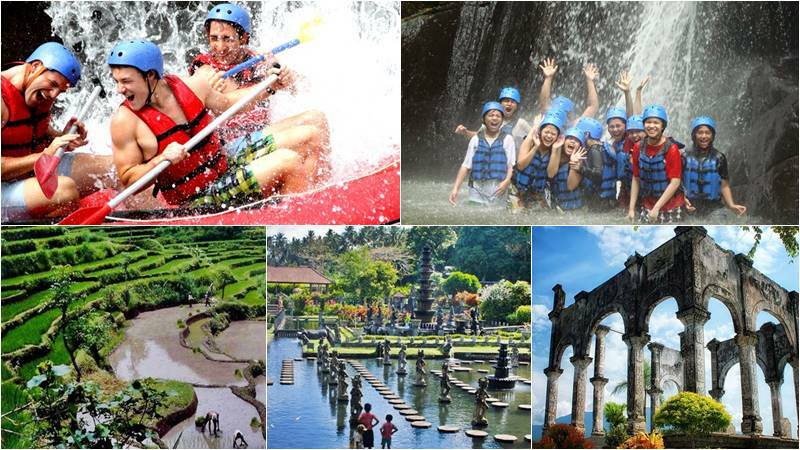 Bali Rafting + Royal Water Palace tour is an interesting Bali rafting tour package combination where you will enjoy Bali river rafting at Telaga Waja river with the most adventure rafting in Bali and 4 meter jump at Bajing dam. This tour will combine with Tirta Gangga Royal Pool and with some country side to explore. Book now only with Bali Rafting Adventure. 09.45 – Arrive at Telaga Waja River start point / Welcome drink + safety Briefing. 10.15 – Start The Rafting Adventure. 13.15 – Arrive at Finish point / Shower + Buffet Lunch. Telaga Waja River Rafting in the sub-district of Rendang, Karangasem is one of the most extreme kinds of adventure you can experience in Bali. Feel the rush of adrenaline on this rafting adventure. Get instructions from an expert rafting guide on paddling and safety procedures. Discover the rice paddies, rocks, cliffs and the valleys of the mountains. See the everyday life of Balinese in their natural life. We challenge you at the end of the trip to dive into 4 meters of waterfall at the Bajing dam. Towel and shower at our finishing points are available. MUNCAN: The country side with rice filed and hill view. The Tirta Gangga Park is one of Bali’s famous eastern tourist destinations. In the middle of the park, many small statues are deliberately placed on the stone for the decoration of the park to look good. All the statues have been taken from historical Hindu epics such as Maha Bharata or Ramayana. Tirta Gangga was built by King Anak Agung Anglurah Ketut Karangasem in 1948. This water park is built in the unique style of Bali and China architecture. Hotel pick up and drop off with fully air-conditioned car/van. Ticket for the rafting at Telaga Waja River.